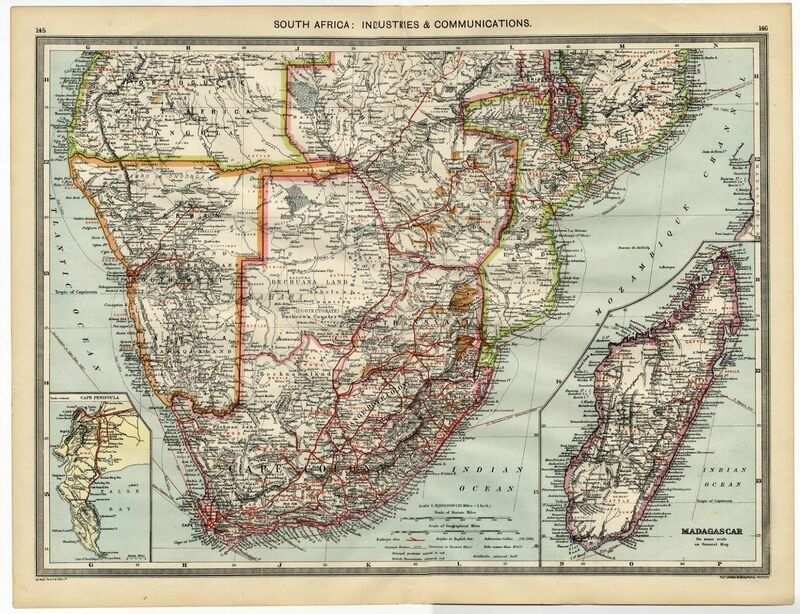 Antique Map SOUTH AFRICA Industries GOLDFIELDS Diamonds IVORY etc. An original circa 190 map (from the date state and not a later reproduction), produced by George Philip and Son for the London Geographical Institute Entitled: South Africa - Industries and Communications With an Inset of Madagascar, and of Cape Peninsula. A very detailed circa 1907 map showing areas from Portuguese West Africa or Angola (part) - Rhodesia (part) - British Central africa - Portuguese East Africa (part) - Transvaal - Orange River Colony - Capy Colony - Bechuanaland and Kalahari - Zululand - Natal etc. There is a large and detailed inset of Madagascar, and a smaller inset of Cape town and Cape Peninsula. It shows the principal through routes by land and sea, including Railways, Canals, Steamship Routes, Submarine Cables etc. With distances to and from various ports in nautical miles. It also marks the locations of British Consul General, Consul, and American Consuls etc. Plus tribal names are shown e.g. Batlaro, Tkobaab, Habobes, Karaqas, etc. It has an original as published fold to the centre. It has a blank reverse (blank apart from titles and a key map). It measures overall 510 x 390 mm ( 20 x 15.25 inches ) approx. and is ideal for mounting and framing. It originally would have been in an atlas, edge mounted and not stapled.This map will be sent rolled in a protective postal tube.